The most significant expense of any wireless video + data system is the "customer premises equipment". Systems configured to allow sharing of equipment between several customers will reduce deployment costs substantially. Choosing the correct subscriber configuration is the most important decision a system operator has to make when selecting the appropriate wireless system. 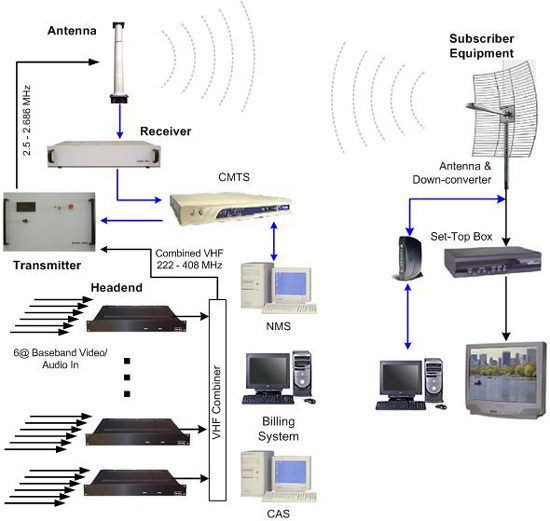 Subscriber equipment for the "Triple Play" wireless systems offered by Racomtel can be configured in three general categories of subscriber configuration options (see figure below). The simplest configuration is the Single Subscriber Option where a single transceiver feeds a single subscriber. With this option nothing is shared. This configuration is most appropriate for residential customers in single family dwellings. 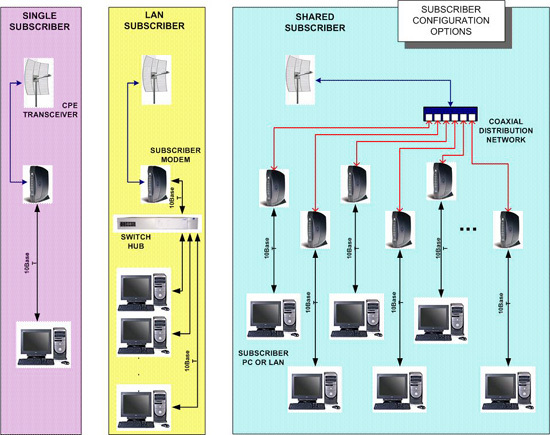 The second category is called LAN Subscriber Option, where a single transceiver feeds multiple users through a single subscriber modem. With this option, the subscriber modem is shared by up to 32 users on a local area network which is connected to the shared subscriber modem. This configuration is generally used for commercial subscribers where the LAN is considered a single subscriber. The third category is the Shared Subscriber Option in which a single transceiver is shared by multiple subscriber networks. The configuration of the subscriber networks sharing the transceiver can vary. They can consist of any combination of a single user, multiple users on a single LAN, or multiple subscribers sharing the same subscriber modem. The number of subscriber networks is limited only by performance requirements of the aggregated subscribers versus the bandwidth available through the transceiver. This configuration option is appropriate for multi-dwelling and/or multi-tenant locations and offers the greatest potential for cost savings. The Integrated System block diagram is shown in the Figure. In a typical system implementation, one individual channel in the band s assigned to downstream data transport. Each downstream channel has capacity for one data carrier with a throughput of 30 Mbps (using 64-QAM modulation). There are a number of options for the upstream (return) signal path. The upstream spectrum can be sub-divided into multiple channels, each with a bandwidth of wither 0.2 MHz, 0.4 MHz, 0.8 MHz, 1.6 MHz or 3.2 MHz. Each upstream channel provides an upstream data throughput of 0.32 to 5.12 Mbps with QPSK modulation format, or 0.64 to 10.24 Mbps with 16QAM-modulation format, depending on channel bandwidth. Typical capacity of the system is five to fifteen carriers, each of which has capacity of 30 Mbps downstream and 10.6 Mbps on the rise.